This is a busy time of year and difficult to keep up on things. This upcoming weekend (Dec 5,6) I will be in New York City at the National Museum of the American Indian. It is downtown at One Bowling Green next to Battery Park. It’s a great show with wonderful artists from around the country. If you are in the area you should swing by and chat while checking out the awesome works these amazing artists bring. The following weekend will be a really busy one. Friday and Saturday the 11th and 12th I’ll be in Olympia Washington at the Evergreen State College Longhouse for their annual holiday art market. This is also a wonderful event with great artists and vendors. This year the market with feature an Indigenous Santa! On Sunday the 13th and Saturday the 19th I’ll be at Daybreak Star in Seattle for the United Indians holiday markets. I hope to see you at one of these markets. If there is something you just have to have, and can’t make it to any of these markets, shoot me an e-mail and I’ll see what I can do. Have a wonderful holiday season everyone! This year I am participating in both SWAIA and IFAM. The Indigenous Fine Arts Market (IFAM) will be at the rail yard in Santa Fe August 19,20,and 21. My booth number is 421, it’s the same location I was in last year. It is quite a good show and if you want a sneak peak at the work I’m showing at SWAIA that is the place to see it. I’ll be in the same booth as the last couple of years right in the plaza for the SWAIA (Indian market) plz621. That is Saturday the 22nd and Sunday the 23rd. I’m working hard to have some new carvings and serigraphs ready for the show. I also have more than a dozen original canvas paintings to choose from which I’ll be bringing down including a large 8ft painting that I’m pretty excited about. I’ve gotten a lot of great feedback on a series of painting I recently completed depicting star children and falling stars. I’m going to hustle and see if I can create a print series based on these paintings before market. I’ll post pictures of work as we near the show. If you want to place an order or see a painting you’d like to own please let me know. Take care and enjoy your summer. I’ve gotten an awful lot of attention surrounding the N7 Holiday Line from Nike and should clarify a few points. First off, the new N7 line is clearly not a Salish design. 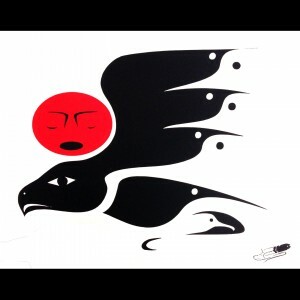 I would never claim it as a Salish design, and will speak with Nike soon to clarify the situation. I remember many years ago when I first decided to print my own work I spoke in great length with Susan Point as well as Andy Peterson and many other outstanding artists who were incredibly helpful. Susan was instrumental in helping me decide to pursue strictly Salish work, which is accurate to who I am, and where I’m from. I followed her advice to do just Salish work after much discussion and a great deal of research and study, and have been grateful ever since. In fact we made some trades and she has some of my early works. The fact that I am described as a Salish artist in the N7 advertisement is unfortunate because of the implications it has. 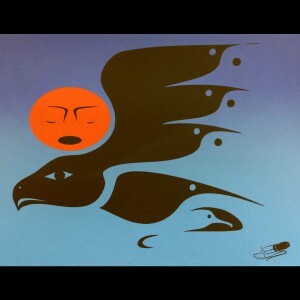 I know as well as most how it could be viewed as a setback in bringing Salish work to the outside world. I will do what I can to rectify the misunderstanding but I don’t know exactly what that looks like at the moment. When Nike approached me about this project they were very clear and upfront about what the project was and more importantly what it wasn’t. They had some very clear guidelines they had to follow. One thing to understand is that N7 is tasked with the unrealistic expectation of representing over 566 federally recognized tribes in the US not to mention the hundreds in Canada and the hundreds more in Mexico. That doesn’t even begin to cover the millions of indigenous peoples elsewhere. So right away this is an impossible task. Nike wanted to do a general Northwest Coastal design. They didn’t want the design to represent ANY specific tribe or tribal group. As you can imagine this is an impossible task, instead Nike wanted a much broader design. My role on this project was to assist the N7 team with coming up with this broad based design. Nike needed an artist who understood the broad based concept and who could put their ego aside and work with their existing team. Obviously I would have loved to lock myself in the studio and design the entire line myself in my own style, which happens to be Puget Sound Salish, however that wasn’t what this project was about. This project was designed to cover the entire Northwest from Alaska to Oregon, and as many of you well know, Northern Formline is what the broader world knows about the Northwest. One of the more ironic aspects of this situation is that I have spent my entire career educating people about the difference between Salish work and the better-known Northern Formline. I’m actually excited about expanding that conversation with the exposure that N7 gets. Thank you for your concern, I understand the confusion caused by the fact I am a Salish artist and this isn’t a Salish design. I’ll do what I can to clarify the situation. That being said, neither I nor Nike claim this is a Salish work. Hopefully in the future I will be able to work with them again and do a straight Salish design. Until then, it’s baby steps. This is the first time Nike has collaborated with an Indian artist to create a line, we are all learning from this process and will continue to improve. In the meantime I will speak with them to clarify some of the language surrounding the marketing. We have updated the website, added new serigraphs, and now we accept orders directly online! This should make it much easier to buy online it should also the process faster. Let us know what you think. It seems that summer flies by faster and faster every year. This summer was the fastest ever for me, talk about busy! I feel very fortunate to be able to do what I do. Art is something that inspires and moves me, it pushes me to try new things and improve on what I am doing. I am practicing with bone and shell to infuse new techniques and materials into what I do. This summer I carved an alder rattle that had a cedar bent-wood box as the base. This rattle was unique in that I carved through the entire side and the inside of the rattle became visible. I also had some inscribed inlay. These are ideas I got from other artists, carvers and jewelers. I think it was Picasso who said that great artists steal ideas. I agree. The world is full of amazingly talented, thoughtful and creative people. Steal their ideas and make them your own! I should be clear here, when I say steal ideas, I don’t mean copy, that isn’t stealing and idea, that is simply stealing. What I mean is look at the work other people are doing, listen to their ideas, be inspired to create something new, something exciting, and something that moves you. I haven’t posted in a while, it has been a busy time. I’ve been doing most of my posts on Facebook so if you want to keep up to date that might be the best way to go. We recently updated our computer and hopefully that will allow me to do a better job of updating this post. There are a couple of shows in December that are in the works but I haven’t confirmed any of them yet. I’ll actually try to check in more regularly on this blog to update and respond to questions. Hope all is well, and we will see you down the road. There are two events coming up that you might be interested in. The event is called “In the Spirit” it is a joint event with the Museum and the Evergreen State College Longhouse. I think it’s the 7th year of the event and it continues to get better and better. I hope you come by and visit the wonder artists selling their works (Like me) and check out the exhibit. This month I have been spending a lot of time in my shop. I call it my shop because that is where things get done. Work is done in a shop. A shop is messy, it gets paint, wood chips, paper scraps and various other odds and ends tossed around. Yesterday I spend an hour or two cleaning up my shop. It’s always good to get your shop cleaned up, get organized and ready for the new project. I love when my shop is clean and organized. That being said there is something about a messy shop too. A messy shop usually means things have gotten done. Today I am expecting visitors to this building that I call my shop. They will know it as my studio. A studio is an artsy place, a place where art is created. 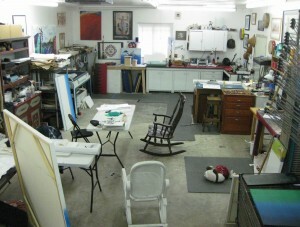 A studio is where art is displayed and creativity abounds. A studio is the fancy term for shop. The building where I work and that houses my art is both. It is a studio when it needs to be, and a shop the rest of the time. It is also a sanctuary and a safe place for my kids to play explore their creativity. The studio is the main reason we bought this house, it is an amazing space and my best work has been produced as a result. If you would like to see the studio, let me know. Arrangements can be made. In the meantime I’m off to the shop. I have a lot of printing, painting, and carving to get done. Normally July is a crazy busy month. This year I wanted to try something a bit different and clear up my schedule consequently I don’t have any events planned this month, (although that might change). I truly enjoy the time I get to spend at home with my family, it’s amazing what a little time with the kids can do for your soul. I’ll also be putting a lot of time in the studio to get ready for Indian Market in Santa Fe and “In the Spirit” here in Tacoma. I have been looking at my inventory and noticed several serigraphs are almost sold out. We recently sold the last of the black otters, and blue jays for example. Anyway several of the serigraphs are running low and I would like to sell them. I wondered about the best way to do this. I’ve decided to have a sale. For the month of July all works will be on sale. (Now you are wondering how big of a sale) I thought about having a flat rate say 25% to 30% sale. That might work and would be good, but math was never my strong suit. What I have decided to do is have the best sale that I can have. Each piece will be different depending on age and price. The older works will be less than the newer works etc. July is also a good month if you wanted any custom work done. If you have been wanting a logo, or a tattoo or a carving etc July is your month. Message me and we will work something out. If there was something you wanted but aren’t sure about the price message me an offer and I just might say yes. To sum it all up, if you ever wanted any of our work, this is the month to do it. You will never get a better price than this July, just shoot me an e-mail and we’ll see what we can get done.